I’m very pleased to announce that the Office of Academic Innovation has appointed a new faculty advisory committee and will convene this group for the first time on Tuesday, September 18, 2018. We’re thrilled to benefit from the experience and expertise of this talented group of faculty leaders as we seek to broaden the impact of U-M’s mission by making our learning experiences accessible at scale and ultimately to create a peaceful, equitable and empowered society. 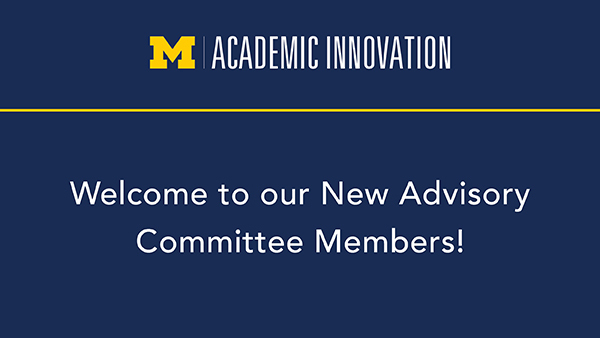 The Academic Innovation Advisory Committee is responsible for advising the the Office of Academic Innovation on policies, activities, and investments that enable the Office of Academic Innovation to fulfill its mission. This new faculty advisory committee will play a critical role in informing our thinking and strategy as we continue to foster a culture of innovation in learning at Michigan and maximize our positive impact on campus and beyond. Barry Fishman, School of Information and School of Education, Professor of Information and Education. Faculty innovators are contributing to U-M’s academic innovation network in many ways as we grow rapidly to serve our expanding global U-M community, enabling people to connect, engage and take control of their life-long learning journeys. In addition to forming the new committee, the Office of Academic Innovation appointed two faculty innovators in residence in the Spring. Professor Barry Fishman and Professor Meghan Duffy are spending their sabbaticals at the Office of Academic Innovation. Both Fishman and Duffy will also serve on the Advisory Committee during their residence. The Office of Academic Innovation also appointed two senior academic innovation fellows. Chris Brooks, Research Assistant Professor at the School of Information, continues to work closely with the Office of Academic Innovation, where he has been a key contributor and faculty innovator for several years, with a focus on learning analytics and the design of online learning experiences. Will Potter, a lecturer in the Department of English, was appointed senior academic innovation fellow in May and focuses on the intersections between academic innovation, digital storytelling, and public engagement including U-M’s Teach-Out series. The Office of Academic Innovation is also facilitating several communities of practice which engage faculty from across academic units, with the aim of increasing adoption of innovative pedagogies and tools championed by faculty innovators. Current communities of practice focus on simulations, gameful learning, and public engagement, respectively. Faculty continue to work closely with the Office of Academic Innovation across a number of initiatives. Currently, more than 90 faculty are working with Academic Innovation across more than 100 projects.